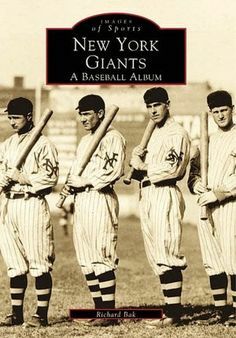 The Giants began as the second baseball club founded by millionaire tobacconist John B. Day and veteran amateur baseball player Jim Mutrie. The Gothams, as the Giants were originally known, entered the National League in 1883, while their other club, the Metropolitans (the original Mets) played in the American Association. Nearly half of the original Gotham players were members of the disbanded Troy Trojans, whose place in the National League the Gothams inherited. While the Metropolitans were initially the more successful club, Day and Mutrie began moving star players to the Gothams and the team won its first National League pennant in 1888, as well as a victory over the St. Louis Browns in an early incarnation of the World Series. They repeated as champions the next year with a pennant and World Series victory over the Brooklyn Bridegrooms. 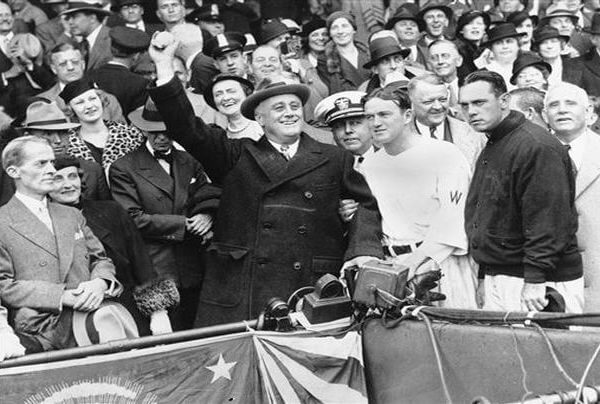 It is said that after one particularly satisfying victory over the Philadelphia Phillies, Mutrie (who was also the team’s manager) stormed into the dressing room and exclaimed, “My big fellows! 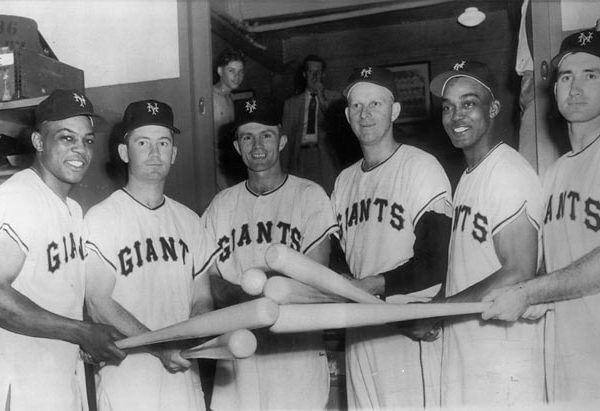 My giants!” From then on, the club was known as the Giants. 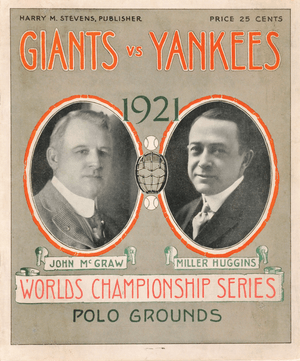 The much-anticipated 1921 World Series featured John McGraw’s New York Giants, dedicated practitioners of the dead-ball era’s “inside game”, and the New York Yankees, who relied on the “power game” exemplified by Babe Ruth, who was coming off of what was arguably his best year ever statistically. The Series was a closely contested matchup which ended on a double play featuring a base running miscue. In the 1922 World Series, the New York Giants beat the New York Yankees in five games, four games to none with one tie; starting this year the World Series was again best-of-seven. 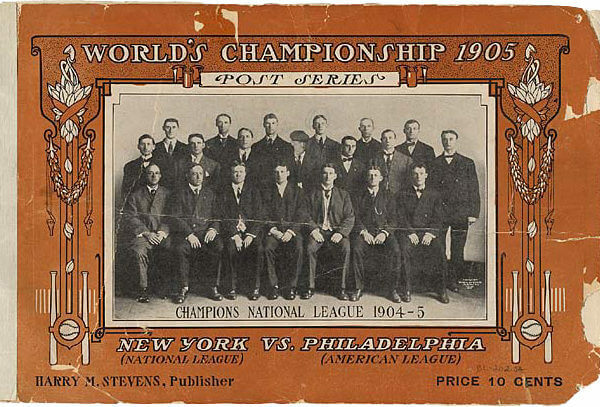 By now, the term “World Series” was being used frequently, as opposed to “World’s Series”. As with the 1921 World Series, every game was played at the Polo Grounds because it housed both teams, with the home team alternating. The 1954 World Series matched the National League champion New York Giants against the American League champion Cleveland Indians. The Giants swept the Series in four games to win their first championship since 1933, defeating the heavily favored Indians, who had won an AL-record 111 games in the regular season. The Series is perhaps best-remembered for “The Catch”, a sensational running catch made by Giants center fielder Willie Mays in Game 1, snaring a long drive by Vic Wertz near the outfield wall with his back to the infield. It is also remembered for utility player Dusty Rhodes’ clutch hitting in three of the four games, including his walk-off hit for Monte Irvin that won Game 1, probably the best-known hit to be described as a “Chinese home run”, since it barely cleared the 258-foot (79 m) right-field fence at the Polo Grounds. Giants manager Leo Durocher, who had managed teams to three National League championships, won his first and only World Series title in his managerial career. After moving West, the San Francisco Giants would not win a World Series until the 2010 season. The San Francisco Giants existed in the New York metropolitan area from 1883 – 1957. Prior to the start of the 1958 season, the team moved to San Francisco, California, where it was renamed as the San Francisco Giants. During the club’s tenure in New York, it won five of the franchise’s eight World Series wins and 17 of its 24 National League pennants. For most of that time, the Giants played home games in the Polo Grounds in the Upper Manhattan region of New York City. The Giants had intense rivalries with their cross-town rivals, the New York Yankees and the Brooklyn Dodgers, known collectively as the Subway Series. 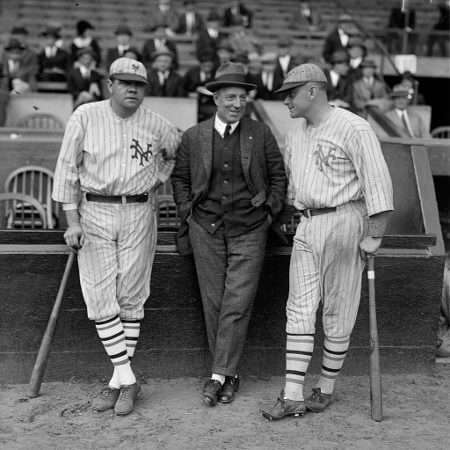 The New York-Brooklyn rivalry soon evolved into the Los Angeles-San Francisco rivalry. Numerous inductees of the Baseball Hall of Fame played for the New York Giants, including John McGraw, Mel Ott, Bill Terry, Willie Mays, Monte Irvin, and Travis Jackson. Some of the most memorable moments in the Giants’ New York history are Willie Mays’ famous catch in game one of the 1954 World Series, The Shot Heard ‘Round the World, and the 1922 World Series, where the Giants defeated the Yankees in four games. Who is the greatest New York Giants (Baseball)? During the club's tenure in New York, it won five of the franchise's eight World Series wins and 17 of its 24 National League pennants.